Daryl Johnson (Worcester Park, United Kingdom) on 1 August 2009 in Documentary & Street and Portfolio. Very nice. I love the black and white for this; in color I think it would probably be crazily chaotic, but the black and white tones it down nicely so you can appreciate it without getting a headache. great composition and a lot going on. great street shot ! I love the composition, the movement of the crowd, all theses umbrellas ! and your monochrome is a delight ! Is there the favorite Izakaya there? Very nice street shot. @Makoto: Thanks Makoto! Actually, I didn't often eat out in this part of town. But, there certainly many restaurants and things around there! Did you ever visit Dotonbori from Hokkaido? This really tells a story of life in the big city. The bikes parked, the bustle of people, the auto, and all those umbrellas. A great image. Very beautiful street shot, Daryl. I love it being in B/W. The contrast, the shades and the tones, all have come perfectly. I love the composition too. Excellent . Love it . Tones are perfect for this shot . Very nice, your shot remind me my travel in Japan. Very nice country with very friendly persons. Again, this really pops in b&w. 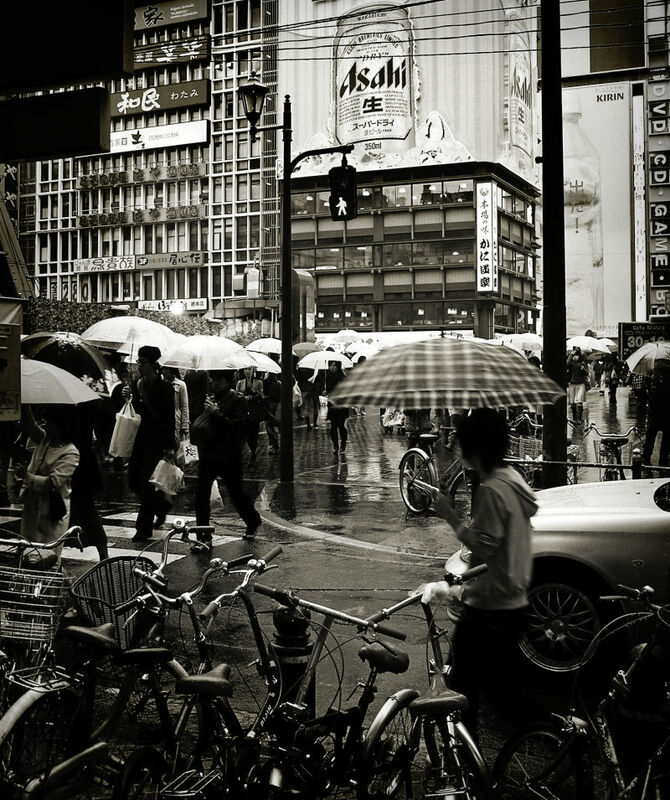 Very good serie of street photography on a rainy day. This is the one that I prefer. Great BW.